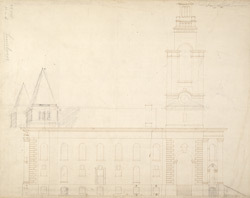 A drawing by celebrated architect Nicholas Hawksmoor of part of his church at Limehouse. This is a the north elevation of a design for the church, which is different from that which is erected. Limehouse was originally in Stepney parish. There was opposition from local clergy to the creation of the new parish here. The fine new St Anne's church, built in 1712-24 was not consecrated until 1730. It was built in the shape of a Greek Cross. The clock is the highest church clock in London and acted as a landmark for ships coming into the East End docks.